Home | Practice Areas | Workers’ Compensation | When Do I Return To Work? After a workplace injury, you should consider several factors before returning to work. Employers and insurers are eager to get you back to work quickly. The sooner you return to work, the sooner they can stop paying you full workers’ compensation benefits. But do not rush yourself back. As long as you are incapacitated by a work-related injury or illness, and you are unable to find work you can do because of your injury, your employer or their insurance company have to continue to pay your workers comp benefits. Have you fully recovered from your workplace injury and been cleared to return to work by your doctor? Have you and your doctor decided that you have reached your Maximum Medical Improvement (MMI) level? Has your doctor told you that, while you may not be fully recovered, you may return your job as long as you follow restrictions? Has your doctor cleared you to return to work but you feel you have not yet recovered from injuries? There are some benefits of returning to work if you feel physically able. In many cases returning to work will mean you will earn more money than you can on workers’ compensation. Being around supportive co-workers can actually help you feel better in the short run. However, as positive as these benefits sound, you should not return to work until you are fully able to either perform your previous job or a new job that will accommodate any work restrictions ordered by your doctor. Do I Have to Return To Work After A Workers’ Compensation Injury? What Are Work Restrictions/Light Duty? What Is a Workers’ Compensation Return to Work Letter? Can My Employer Fire Me or Lay Me off If I Don’t Return to Work Fast Enough? You should advise your doctor in detail what your job duties are. You should then ask your doctor whether you need any restrictions on what you do when you go back to work. For example, if your job requires you to do heavy lifting, you should ask your doctor if they believe you can do heavy lifting. If the doctor says you have restrictions, you should get a written note describing those restrictions. You should then provide a copy of that note to your employer and keep a copy for your own records. If your employer does not honor the restrictions when you return to work, you should contact a workers’ compensation lawyer immediately. When a doctor releases you to return to work, with or without restrictions, your employer or its workers’ compensation insurance carrier must send you a form entitled Notice of Ability to Return to Work with the doctor’s release before they can offer you a return to work. If you receive a return to work offer before you receive a Notice of Ability to Return to Work form, you should contact a workers’ compensation lawyer immediately. If a doctor says that you can return to work, but you feel that you are not well enough to return, you should contact a workers’ compensation lawyer immediately. Very often a doctor who you see for an Independent Medical Examination (IME) will indicate that you are capable of working at a greater physical level than your own doctor, and the employer will choose to offer a return to work based upon the IME doctor’s restrictions. If this happens, you should contact a workers’ compensation lawyer immediately. If a doctor releases you for a return to work and you simply do not go back to work, you will jeopardize your rights to receive workers’ compensation benefits. When you return to work, your employer or the insurance company may ask you to sign papers regarding your case. They may tell you that you are simply signing to receive your final check. These documents will affect your rights now and in the future to receive wage loss benefits and get medical bills paid. DO NOT sign any documents without having a workers’ compensation lawyer review those documents first. 1. Stay in touch with your employer while you are on leave because of your injury. If you know you are going to returning to your job when you recover from your injury, make sure you stay in touch with your employer. Let them know how you are progressing and what your doctor is telling you about your ability to return to work. Do not let them pressure you, however, into returning early. This is a courtesy gesture to show your employer you are not trying to take advantage of them. 2. Notify the proper authorities you are returning to work. Before you return to your job, you should notify your Workers’ Compensation Board. You and your attorney should also let them know about any work restrictions or if you can only partially return to work. If you have reached your MMI, but you are still unable to return to full-time employment, you may continue to receive partial workers’ comp benefits. 3. Create an effective return to work plan. A return to work plan can help you transition back into your job and become fully productive again. It is even more important to create a return to work plan if you are still partially disabled from an injury you received on the job. When you and your employer create such a plan, it helps to avoid any misunderstandings. An acknowledgment from your employer that they understand any limitations placed upon you because of your workplace injury. 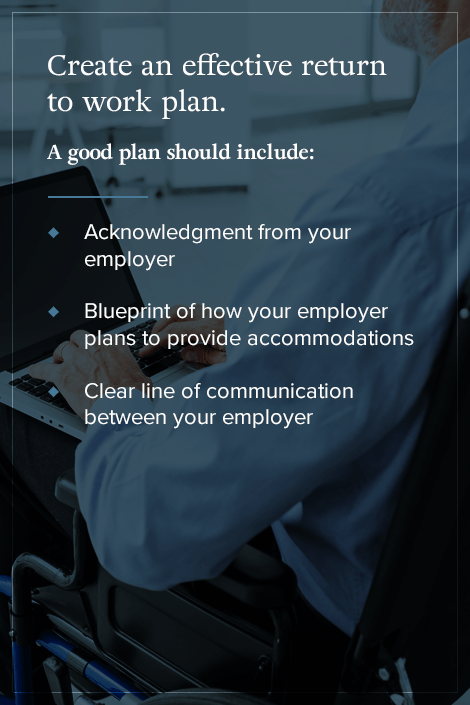 A blueprint of how your employer plans to provide accommodations because of these restrictions that will allow you to transition back into the workplace without any concerns about your safety or any unnecessary discomfort. A clear line of communication between your employer, you and your physician so everyone knows when you can return to your former job duties as soon as you are medically able. 4. Always have a copy of your workplace restrictions available when you’re on the job. Even if you and your employer have worked out a return to work plan, occasionally a manager or another employee may question why you are not doing more, and they may ask you to do a job that you are not physically able to perform. It is a good idea to always have a copy of your doctor ordered restrictions available on your job site. These people may not be aware that you have physical limitations that prevent you from doing more than you are able. You can still be a very productive employee regardless of any injury or disability. An injury does not define who you are as a person. If your doctor, or a workers’ compensation doctor, has given the okay for you to return to work, you are required to do so unless you can successfully appeal their decision. Remember you can always ask for a second opinion. But if you do not return to work, you face losing any workers’ compensation benefits to which you may still be entitled. If you are returning to work with a partial disability or some workplace restrictions, you can ask for reasonable accommodations to help facilitate your return. Sometimes your employer will place you in a new position because of these restrictions. If you are being paid less because you had to take this new position, you may be eligible for reduced earning compensation. Make sure you work closely with your lawyer if you find yourself in this position. As noted above, you may reach your MMI level but still be partially disabled or injured. In these situations, your doctor may release you to return to your job but only with certain restrictions. For instance, your doctor may prevent you from lifting objects heavier than 40 pounds, limit the amount of repetitive activity that a job may require or reduce your overall workload. Remember, if your doctor says you can return to work with limitations, you are required to do so. Not doing so means you could lose your job and any workers’ compensation benefits you are receiving. An experienced employee is difficult and costly to replace. Helping you find a job within the company that accommodates your restrictions costs them less money. A study by the U.S. Department of Labor shows that most accommodations made for workers returning to work after a workplace injury do not cost the employer any money. Remember, always keep a copy of the restrictions and limitations ordered by your doctor with you. If a manager or supervisor continues to ask you to perform duties that conflict with your doctor’s restrictions, despite knowing that you have doctor-ordered restrictions, make sure you contact your workers’ compensation lawyer. If you are forced to perform a job outside of the restrictions, and you reinjure yourself, tell your supervisor and contact your attorney as soon as possible. A Notice of Ability to Return to Work letter is a form completed by a doctor which says that they have cleared you to return to your job with certain restrictions and limitations. The Return to Work letter does not mean you need to return to work immediately. You only need to respond to the letter if you have been offered a job by your employer that fits within the restrictions that the doctor has outlined in the letter. It’s important you know which doctor issued the form. Often a doctor who works for the employer’s insurance company will issue such a form. It is one way they can try to force you to return to the job, and if you refuse, file a petition to end your benefits. If you feel that you are unable to return to your job under the guidelines proposed in the Return to Work notice, it is imperative that you consult with your own doctor and your attorney. For instance, your own doctor may feel that you are not yet ready to return to work under the guidelines issued by the insurance company’s doctor, so your attorney can use this to argue that you should continue to receive workers’ compensation benefits. Employers generally hate paying workers’ compensation benefits. If you have a great employer, who will hold your job open for you until you are healthy enough to return to work, consider yourself lucky. If your company has an employee’s manual that sets out guidelines for how employees can return after a workplace injury, make sure you read it carefully. Unfortunately, this is probably not the case at smaller companies which seldom have these sort of documents. Unless you are a contract employee, the law in Pennsylvania allows your employer to fire you or lay you off for almost any reason. They may not, however, fire you because you have filed a workers’ compensation claim. But employers can find all kinds of ways to dismiss an employee who has been off the job because of a workplace injury including accusing you of poor performance in the past, saying the company must downsize or reorganizing your department. What often happens in this situation is that the employer’s insurance company will make you a settlement offer. This offer is almost always far below what you will need to deal with your medical expenses and your lost wages. But if you refuse it, they will try to use it as an excuse to end your workers’ compensation benefits. This is one reason why it is so important to work with a workers’ compensation lawyer. If you are laid off or terminated while you are receiving workers’ compensation benefits, whether you have returned to your job with restrictions or are still on leave because of your injury, you may still be entitled to receive workers’ compensation benefits. Make sure you contact your attorney immediately if this happens. When it comes to workers’ compensation, a return to work will generally mean an end to benefits. It is important not to return to work until you are fully recovered, and a medical professional has determined it is safe to return. Returning too early can increase your risk of re-injury or complications and can make it more difficult for you to heal fully. If there are problems with workers’ compensation benefits, such as late checks, or if you are considering returning to work because you feel pressured to do so for any reason, contact a workers’ compensation attorney before returning. If a doctor has cleared you for work but you do not agree with the assessment, contact an attorney. You can always reach KBG Injury Law to schedule a free consultation. Or call us at 1-800-509-1011. A member of our team will get in touch with you as soon as possible.